For beginners and advanced players. 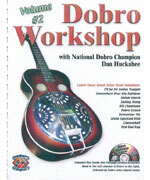 Learn the correct styles of five leading Dobro players. Dan is accompanied by a full Bluegrass band, with dobro recorded in the left channel and band in the right. Dobro solos are played again slowly at the end of each side. Volume 2: Josh Graves: Great Speckled Bird, Shilo March. Brother Oswald: I'll Be All Smiles Tonight, Sailing Along. Mike Auldridge: Cannonball, Dobro Island (contains a twin part). Jerry Douglas: Bill Cheatham, Redbud Rag. Dan Huckabee: Remember Me, Somewhere Over the Rainbow. (CD & Tab) -------------------------------------------------------------------------------- About Dan Huckabee Dan Huckabee, has a degree in Music from The University of North Texas. He won the National Dobro Championship, & has played with The Allman Brothers, Lyle Lovette, Nancy Griffith, & Robert Earl Keen Jr, just to name a few. Dan founded Musician's Worskhop in 1973, teaches Guitar, Dobro, Mandolin, & Harmony Singing at The University of Texas Informal Classes, has taught workshops & seminars at festivals all over the United States, & has authored over 250 music instructional products. So get comfortable & let Dan's lifetime of musical experience guide you through everything you need to know in the quickest & easiest way possible!